Lea Lange was born in Dresden and raised as an Orthodox Jew. However, she found the Orthodox environment stifling, and in 1922 she began several years of art studies, first at the Academy of Arts and Crafts and then at the Academy of Art. Lea was impressed by the works of Barlach and Kokoschka, and the War cycle by Otto Dix reinforced her deep convictions as a pacifist. Around 1924, she met her future husband, the artist Hans Grundig, who came from a working-class background, and in 1926 both joined the Communist Party. Lea's father strongly objected to her political views and her association with Grundig. He sent her to a sanitarium in Heidelberg, and when Hans joined her there, Lea was shipped to Vienna. Again, Hans followed, and in 1928 the couple married. From that time on, they lived among their proletarian friends in one of Dresden’s poor housing units and eked out a meager living. In 1930, the couple and their friends joined the just-formed local branch of the Communist "Asso" (Association of German Revolutionary Artists). Lea Grundig preferred to create works on paper rather than on canvas, mostly in blacks, greys and whites, portraying her subjects in a social and psychological context that often reflected the misery and hardship of the working poor. 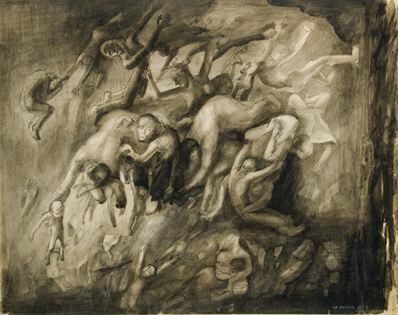 In several etching cycles done during the early Nazi years, she aimed to depict "the thousand fears, the presentiment of doom, the imprisonment of the persecuted, the inhumanity and the fight against it by the best of mankind." Starting in 1936, both Grundigs were in and out of concentration camps as a result of their past Communist affiliations and ongoing anti-Nazi activities. Lea managed to emigrate to Palestine, but Hans was incarcerated for the duration of the Nazi period. After World War II, Lea rejoined her husband in Dresden. Despite her unwavering Communist sympathies, Lea did not always have an easy time with the repressive East German regime, though toward the end of her life she was showered with many official honors.